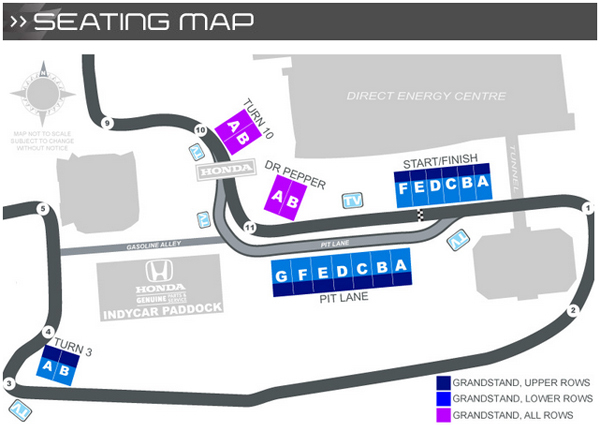 Welcome to More Front Wing’s Spectator Seating Guide for the Honda Indy Toronto! For this guide we’ll take a lap around the track beginning at the start/finish line, so be sure to check each heading to see whether the grandstand you’re looking at is for reserved or general admission seating. The images shown were captured on July 18, 2014, and ticket prices shown are as at the 2014 event. My own preferences are provided in the verdict section at the end of the post. A disclaimer before we begin: this site and this post are in no way affiliated with the Honda Indy Toronto, and the photographs and opinions presented here are my own. Also worth noting: The Fan Friday program continues, which offers free admission on Friday with a donation at the gate to Make-a-Wish Canada courtesy of the Ontario Honda Dealers. Frequent readers of these guides will know that pit lane grandstands tend not to be my favourite. And given that this stand is the same price as the seating in turn 3, I would personally take turn 3 any day of the week. But there are plenty of people who prefer to see the action on pit lane over the driving, and as pit grandstands go this one is actually quite good. The number of seats in this area has come down significantly due to the construction of the hotel immediately to the east, but this stand (along with all of the others) appears to be notably taller than in previous years. From all sections you get a nice, big TV and a good view of most of pit lane. Section A, to the east, is a bit further away from the fan zone (and all of the food and beer that it offers), but the view of pit out is superior — and, surprisingly, so is the view of turn 11, which gets cut off by suites when you sit on the west end in section G. Therefore, for those who get around fairly easily, the easterly sections (A and B) should offer better value. Height would not be a serious concern down to roughly row 10 or so. Below that, sightlines might begin to be impeded. 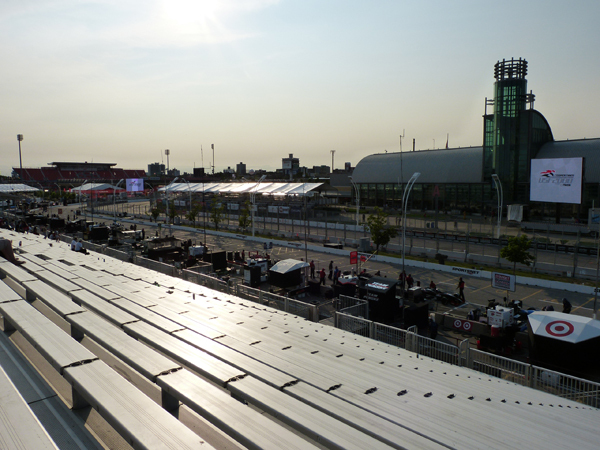 The view from the Honda Indy Toronto pit lane grandstand, section A, facing toward turn 11. This stand is tricky to get the right seat in, but choosing it has its advantages. It probably offers a better vantage point of pit lane and pit out than the pit lane stand does, plus from the right place you can see clear down to turn 1. The Direct Energy Centre is also immediately behind it, which offers very quick access to refreshments, washrooms, and air conditioning when needed. 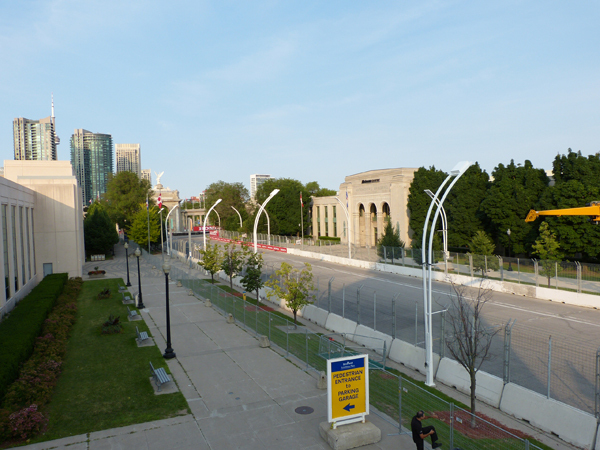 Plus, it’s on the outside of the track close to nearly all of the entrances, so it’s easy to access without needing to navigate pedestrian bridges. The factors that should influence a purchasing decision include TV position (it’s a bit harder to see from sections A, E, and F) and how important a view of turn 1 versus pit out is to you. Unless you’re able to score the seats to the far east of the stand (the edge of section A) that offer a clear view of turn 1, sections C and D seem to strike the best balance. From A and B, with people in the way standing up constantly, you wouldn’t see as much in turn 1. Higher rows would definitely be the better choice here. 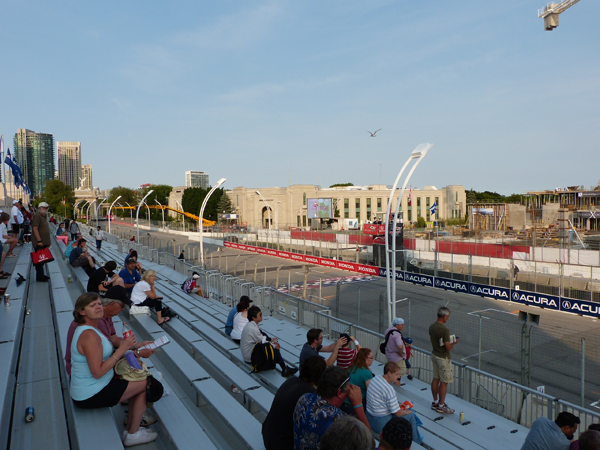 The view from the Honda Indy Toronto start/finish grandstand, section F, facing start/finish and turn 1. The Honda Indy Toronto start/finish grandstand, section A, facing turn 1. Only the seats closest to the edge of the stand offer this view. 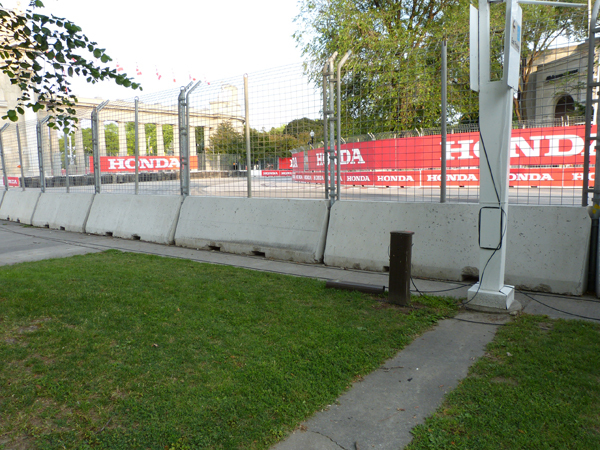 The view of turn 1 at the Honda Indy Toronto from the standing zone between the start/finish stand and the Princes’ Gate.